1Departments of Orthopaedic Surgery, Enshu Hospital, Hamamatsu, Shizuoka, Japan; 2Departments of Orthopaedic Surgery, Hamamatsu University School of Medicine, Hamamatsu, Shizuoka, Japan. Barrett’s adenocarcinoma is an esophageal cancer arising from Barrett’s esophagus. In this report, a metastatic epidural tumor from Barrett’s adenocarcinoma with paraplegia that required surgical treatment is documented. A 50-year-old man who had had a resection of the distal esophagus due to Barrett’s adenocarcinoma six month before presented with progressive weakness and numbness in lower limbs with urinary disturbance. Magnetic resonance imaging of the thoracic region revealed compression of the spinal cord at the T3-4 level by a dorsally located epidural mass. No signal changes were detected in vertebrae. Since the paraplegia and urinary disturbance were rapidly progressing, laminectomy and tumor resection was performed. Postoperatively, neurological function improved immediately and there was no recurrence of spinal region. This is the first report on an isolated metastatic Barrett’s adenocarcinoma of the thoracic epidural space. Barrett’s esophagus, which is defined as intestinal metaplasia in the distal esophagus, is considered one of the risk factors of esophageal adenocarcinoma . Most cases of esophageal carcinoma are pathologically squamous cell carcinoma among Japanese, however adenocarcinoma derived from Barrett’s esophagus called Barrett’s adenocarcinoma is increasing in number recently . Although several case reports of the metastatic cancer in the epidural space have been documented, that derived from esophageal carcinoma is rare. To our knowledge, no cases of epidural metastasis without bone involvement from Barrett’s adenocarcinoma have been reported in the literature. We present here a case of metastasis to the thoracic epidural space from adenocarcinoma in Barrett’s esophagus that required surgical intervention due to progressive paraplegia. A 50-year-old man presented with a 2-day history of progressive weakness and numbness of lower limbs. Six months previously, he had a resection of the distal esophagus due to adenocarcinoma in Barrett’s esophagus. As metastatic para-aortic lymph nodes were observed during operation, complete lymphadenectomy was performed. No other organ metastasis or distant lymph nodes metastasis was detected by computed tomography of the chest-abdominal region. He was categorized as stage 4 according to the TNM stage classification. He could not walk nor stand from a squatting position. He complained of difficulty urinating in the morning. Neurological examination revealed that muscle motor test of lower limbs was 2/5 in iliopsoas, 2/5 in quadriceps, 3/5 in tibialis anterior, 3/5 in extensor hallucis longus, and 3/5 in gastrocnemius bilaterally. Severe deterioration of sense was manifested under the level of umbilicus. Deep tendon reflexes of both lower extremities were hypereflexia and Babinski response was obtained bilaterally. Plain radiographs and computed tomography of the thoracic spine revealed no signs of bone metastasis includeing bone destruction or erosion. Magnetic resonance imaging (MRI) of the thoracic spine revealed compression of the spinal cord at the T3-4 level by a dorsally located epidural mass with isointensity and enhanced on T1- weighted MR images and increased signal intensity on T2-weighted MRI (Figure 1). No signal changes were detected in vertebrae. Laminectomy of T3 and T4 and tumor resection was performed under general anesthesia since the paraplegia and urinary disturbance were rapidly progressing. The tumor was identified on the dorsal side of dura matter after laminectomy. No adhesion around the tumor was observed and the tumor was easily excised en bloc (Figure 2). 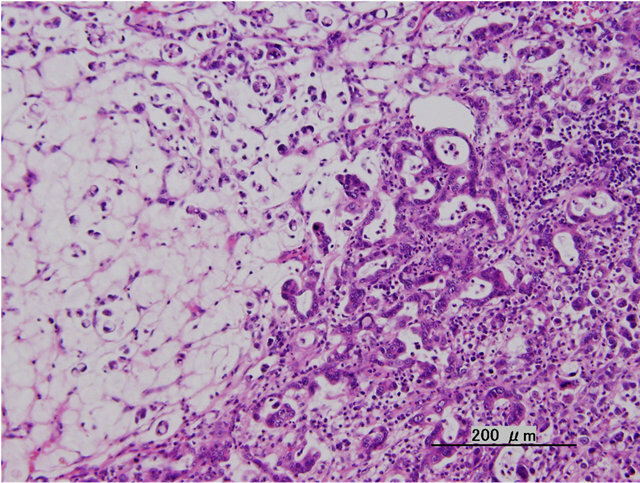 Histopathological examinations confirmed a metastasic adenocarcinoma arising from the thoracic epidural space (Figure 3). Postoperatively, motor dysfunction and dysuria improved immediately and adjuvant chemotherapy was started. On follow-up MRI at 3-month postoperatively, the epidural mass disappeared and no other metastasis were detected although intramedullary increased signal on T2-weighted MRI appeared that was considered as a spinal cord injury (Figure 4). At 3 month after the operation, he was ambulatory with a walking aid. But he died 7 month after the operation due to lung metastasis. No recurrence of spinal region was observed on pathological anatomy. Figure 1. Sagittal image of thoracic spine. 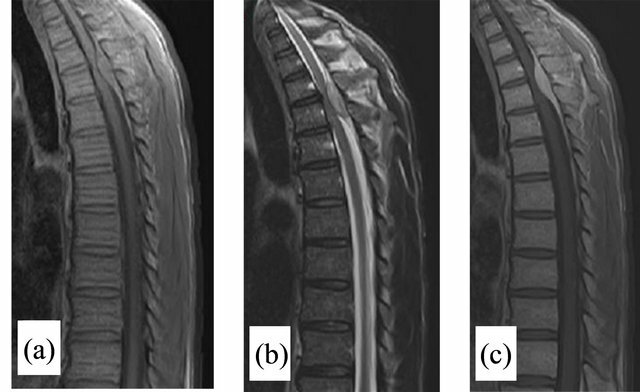 Spinal cord was compressed by the dorsally located epidural tumor at the T3-4 level with isointensity and enhanced on T1-weighted MR images ((a) and (c)) and increased signal intensity on T2-weighted MRI (b). Figure 2. An intraoperative photograph (Left). The epidural tumor existed on dura matter without adhesion and was easily excised en bloc (Right). Figure 3. Histological appearance of epidural mass. Atypical epithelioglandular cells spread and formed an irregular glandular structure compatible with metastatic adenocarcinoma. Figure 4. 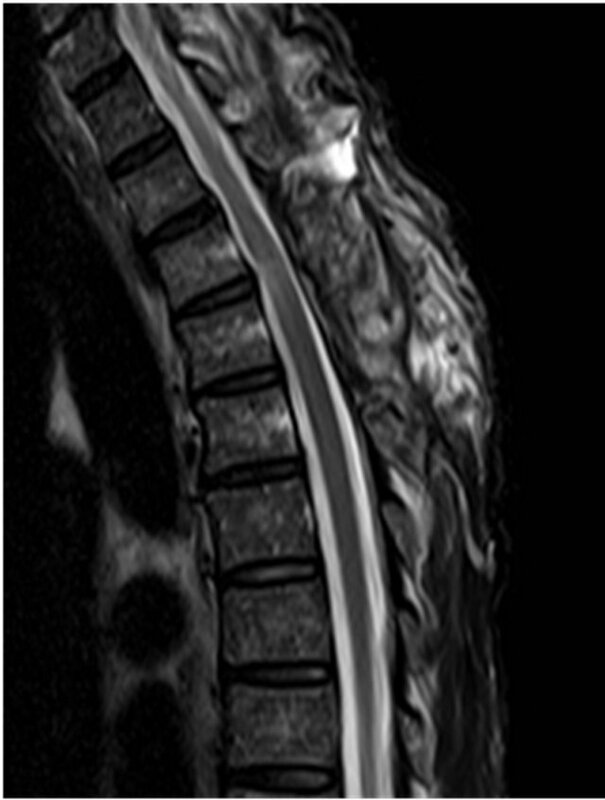 Axial T2-weighted image of the thoracic spine examined at 3 months after operation. The epidural tumor was excised entirely without any local reoccurrences. An isolated epidural metastatic tumor without bone involvement is rare and thought to be caused by a direct hematogenous dissemination via radicular arteries or vertebral venous plexus from a primary site; indeed, metastatic para-aortic lymph nodes were observed during the first operation, and the patient was categorized as stage 4 according to the TNM stage classification. In this case of isolated metastatic epidural tumor from Barrett’s adenocarcinoma, no adhesion around the tumor was observed and it was easily excised en bloc, therefore good neurological recovery should be obtained postoperatively. T. Lerut, W. Coosemans, D. Van Raemdonck, B. Dillemans, P. De Leyn, J. M. Marnette and K. Geboes, “ Surgical Treatment of Barrett’s Carcinoma,” The Journal of Thoracic Cardiovascular Surgery, Vol. 107, No. 4, 1994, pp. 1059-1065. M. Hongo and T. Shoji, “Epidemiology of Reflux Disease and CLE in East Asia,” Journal of Gastroenterology, Vol. 38, No. 15, 2003, pp. 25-30. H. O. Chade, “Metastatic Tumors of the Spine and Spinal cord,” Handbook of Clinical Neurology, Vol. 20, No. 2, 1976, pp. 415-433. R. L. Wright, “Malignant Tumors in the Spinal Extradural Space: Results of Surgical Treatment,” Annals of Surgery, Vol. 157, No. 2, 1963, pp. 227-231. M. Rodoriguez and R. P. Dinapoli, “Spinal Cord Compression with Special Reference to Metastatic Epidural Tumors,” Mayo Clinic Proceedings, Vol. 55, No. 7, 1980, pp. 442-448. K. Shibasaki, C. G. Harper and G. M. Bedbrock, “Vertebral Metastases and Spinal Cord Compression,” Paraplegia, Vol. 21, No. 1, 1983, pp. 47-61.